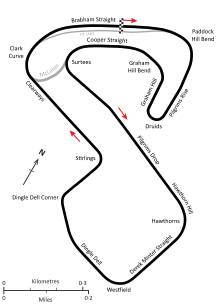 The 1984 British Grand Prix (formally the XXXVII John Player British Grand Prix) was a Formula One motor race held on 22 July 1984 at Brands Hatch, Kent, England. It was race 10 of 16 in the 1984 Formula One World Championship. The 71-lap race was won by Austrian driver Niki Lauda in a McLaren-TAG, with local driver Derek Warwick second in a Renault and Brazilian Ayrton Senna third in a Toleman-Hart. Going to the race, McLaren driver Alain Prost led the Drivers' Championship with 34.5 points, ahead of teammate Niki Lauda on 24 points and Lotus driver Elio de Angelis on 23.5. René Arnoux (Ferrari) was fourth with 22.5 points while Keke Rosberg (Williams) was fifth on 20 points. In the Constructors' Championship, McLaren were leading with 58.5 points, Ferrari and Lotus were second and third with 31.5 and 29.5 points respectively, while Williams with 24 and Brabham on 21 points contended for fourth place. Prior to the event, the Fédération Internationale de l'Automobile (FIA) announced that Tyrrell would be disqualified from the World Championship for the illegal use of fuel and ballast on their cars. The ruling resulted in all points scored by Tyrrell throughout the season being removed. Tyrrell owner Ken Tyrrell was granted a High Court order to allow their cars to compete in the Friday Qualifying session. As a result of his crash in the previous race at Dallas in which he broke both of his ankles, Martin Brundle was replaced in the No. 4 Tyrrell by Swedish driver Stefan Johansson. Johnny Cecotto broke both legs after a heavy crash during qualifying. He would never race in Formula One again. Nelson Piquet claimed pole position. Niki Lauda's win for McLaren saw him become the highest point scorer in Formula One history, passing Jackie Stewart's 390. Renault driver Derek Warwick gave the British fans something to cheer when he finished 42 seconds behind Lauda in second place, while Cecotto's Toleman teammate Ayrton Senna finished 21 seconds behind Warwick in third. Lotus-Renault driver Elio de Angelis kept his championship hopes alive finishing a lap down in fourth place. He was followed by the two Ferraris of Michele Alboreto and René Arnoux in the final points positions. Lauda's win saw him move to 33 points and with Prost failing to finish his championship lead was cut to just 1.5 points. With 67.5 points, McLaren had scored almost double the amount of Constructors' points than second placed Ferrari who were on 34.5 points. Eddie Cheever (Alfa Romeo), Philippe Alliot (RAM) and Jo Gartner (Osella) were all outed in a first lap crash which started when Riccardo Patrese lost his Alfa going into Graham Hill Bend. The race was stopped 11 laps to clear Jonathan Palmer's RAM, a move which many felt had more to do with the McLaren's having passed pole sitter Nelson Piquet (who was headed to the pits to change tyres). Due to the rules, when the cars formed on the grid for the restart, Piquet's Brabham-BMW, complete with a change of tyres, was back on the pole, though it didn't do any good as Prost won the restart while he was also passed by Lauda under braking for Druids on the first lap. ^ "Tyrrell are banned for rest of season". The Glasgow Herald. 19 July 1984. p. 16. ^ "Tyrrell wins ruiling, to be in British Grand Prix". The Tuscaloosa News. 20 July 1984. p. 15. ^ "John Player Special British Grand Prix - QUALIFYING 1". formula1.com. Retrieved 11 May 2018. ^ "John Player Special British Grand Prix - QUALIFYING 2". formula1.com. Retrieved 11 May 2018. ^ "John Player Special British Grand Prix - OVERALL QUALIFYING". formula1.com. Retrieved 11 May 2018. ^ "1984 British Grand Prix". formula1.com. Archived from the original on 4 November 2014. Retrieved 23 December 2015. ^ a b "Britain 1984 - Championship • STATS F1". www.statsf1.com. Retrieved 13 March 2019.